Do you struggle with finding clients? Are you currently making the income you desire? Are the services you offer clearly defined? If you answered no to any of these the answer may be you need to choose a niche. What exactly is a niche? Simply put, a niche is your area of expertise. Your specific specialty supported and strengthened by your enhanced education and experience is what defines your niche. Your niche can be the type of services you provide or it can be the industry you work in. Having a specialty allows you to stand out from the crowd. It not only will help draw clients to you it helps you to find more work and command a higher rate of pay. Working in a specific niche gives you the opportunity to become the known skilled professional in your field. It can also help provide a path to create an effective, well-designed marketing plan targeted to a narrow audience that is comprised of your ideal clients. This makes it easier to be very clear about who you help and what you do for them. Saying you can help anyone and everyone makes it difficult for potential clients to identify with you. When you have a specialty, you can hone your skills. You learn the language and better understand the problems that are unique to your market. Working in a specific niche and taking advantage of advanced training in your area will help you gain a greater understanding of a particular industry so you can help your clients on a more in-depth level. You become more valuable because your expertise within the industry means that you can help your clients make good decisions about maximizing their marketing efforts and their own services and fees. And as an added bonus, when you’re able to be very specific about your ideal client it makes it much easier for your network to know who to refer to you. The author assistant certification is a good example of how you can drill deeper to develop a specialty within your niche in order to better differentiate yourself. Adding one or more specialty services needed by your target market will allow you to expand your offerings and make the services you offer more valuable. 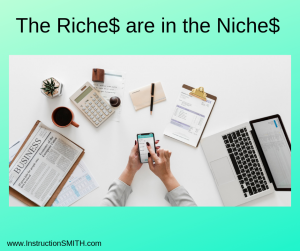 How do you find the niche that’s right for you? What kind of work do you enjoy doing most? What are your passions? Think not only of the kinds of work you enjoy doing but what industries are interesting to you. Is there a demand for services within the industry? For instance, the publishing world is changing and more authors are choosing to self-publish. That means that there are a lot of people looking for help to manage all the details that are required to bring their book to the world. Be very clear about who is a perfect fit for your services, products and programs. Market to those perfect clients, specifically. Continuous, self-motivated learning helps set you apart as an expert in your particular field. Ongoing education is essential for those who wish to hone specific skill-sets and increase their knowledge in order to successfully reach their ultimate career goals. Learn all you can about the industry of your ideal client. Learn the terms they use within the industry. When potential clients hear you speaking their language they are more confident that you can help them. Put yourself in the same room as your ideal clients. Since our niche is working with authors, we research local writer’s groups, sign up and go to their meetings. We also attend book fairs and publisher conferences. This gives us the opportunity to not only meet potential clients but to meet other people who work with our perfect clients providing different services. They can become valuable referral partners. Even after you have developed your specialty and niche you will still have to market yourself. Let people know what you do and the services you offer. Ask for referrals by letting people know what you do and the characteristics of your perfect client.